Buzz Johnson, people’s educator and the founder of Karia Press, died this week. 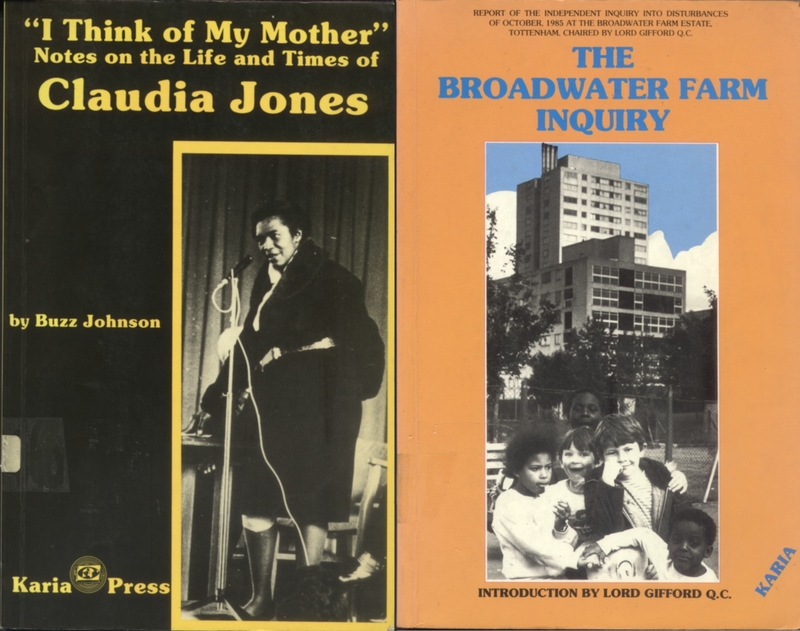 Two giants of the Caribbean diaspora died this week – Stuart Hall, academic and cultural theorist; Buzz Johnson, publisher and people’s educator. They represented two ends of a black left spectrum of politics – the one an acclaimed theoretician and eminent wordsmith who influenced a phalanx of students with his ideas, the other a practical man who single-handedly ran a black publishing venture, Karia Press, which uncovered/discovered and publicised a whole range of Caribbean writers and thinkers. Stuart Hall has been rightly claimed and acclaimed for his massive contribution. But Buzz, in the shadows till the last, has never had his due recognition. Born in Buccoo, a small fishing village in Tobago, Buzz set up the Karia Press in London in the early 1980s. Despite being dogged by constant financial problems and having frequently to move base, he managed, as a one-man-band, to publish an amazing array of over fifty books. And they were important ones. Many of the Caribbean poets who are now household names, were first published by Buzz – Elean Thomas, Merle Collins, Brother Resistance. He published key Caribbean writers on Language such as Hubert Devonish writing on Creole and Dr Morgan Dalphinis on language and memory. He kept in the public eye the works of veteran Caribbean stalwarts such as George Lamming and Richard Hart. But more than that, Buzz was an innovator and excavator. It was he who researched, authored and published the first book on then forgotten Claudia Jones, I think of my mother in 1984. He commissioned and published Amos A. Ford’s book on the obscure British Honduran Forestry Commission’s work in Scotland 1941-44. Steeped as Karia was in Caribbean history and thought, Buzz was to use the press, too, as a tool in UK-based struggles. He published the report of the independent inquiry into the Broadwater Farm riots of 1985, chaired by Lord Gifford and followed it up with Broadwater Farm Revisited in 1989. He published too the independent inquiry report into the shooting to death in Stoke Newington Police Station of Colin Roach in 1983. For Buzz, publishing was never about fame or fortune; it was part of struggle, educational struggle. He pioneered the publishing of many books in London so as to then ship them back to small Caribbean islands that had no presses of their own. And he would also superintend the shipments of remaindered and used books to schools in Trinidad and Tobago that could not afford their own textbooks. A fighter in his own right, a pioneer and risk-taker he was also a great friend, giving of himself – his smile shy and rueful, his manner gentle and self-effacing. He will be sorely missed. Yes, Buzz was dedicated and encouraging. His smile will be missed. Thanks for a very extensive and moving piece on the life of Buzz Johnson. Buzz also published my ‘Many Struggles: West Indian Workers and Service Personnel in Britain (1939-45), in 1984. This is a great piece and it brings back memories of other authors that he encouraged and brought into the light. RIP Buzz. Buzz made an amazing contribution to the publishing world. He had a great, bright mind, his works should not be forgotten. Buzz Johnson was a gentle giant,and an encourager who went out of his way to be assistive. It is truly stated that because of Buzz and his initiative, many grassroot authors were published. RIP Buzz,you will surely be missed although your smile will remain in our hearts forever. RIP – great man and cuz, will not be forgotten. Blessings to his British family. Humble, inspirational, tireless and resourceful are words that are totally inadequate to describe the phenomenal brother that many simply knew as Buzz. Some of us like myself are fortunate enough to have been able to call him friend. I still can’t believe that I won’t walk into a community function and see him there. We have lost a community great. Buzz was laid to rest in his homeland Tobago, yestetday Tuesday 10 March 2014. This is the date of my daughtet’s birthday. Words could not express my loss of my dear friend. I won’t ring his number any more nor will I ask others how he is. I know where he lives now and I will. Visit him soon. My children and I will miss him. I worked with Buzz on the early Karia Press publications. He didn’t have the money to pay for the printing when he came to see us at Islington Community Press . . . but such was his gentle passion that I ended up working through lots of nights with him, so that all he got billed for was the materials we used. And they were some of the best times of my life. I can still hear his warm, soft, gentle voice. His books still sit on my bookshelves; packed and repacked whenever I moved. They are amongst my fondest treasures. Thank you Buzz, for the joy and the laughter that sustained us both during those long nights. I will miss you. I remember Buzz from a long while ago and even though we have not been in contact for years, he was not someone you would likely forget. Sincere condolences to his family. Yvette Thomas, I will try to find a way to connect with you.